After many compliments about my holiday photos and poking around my copy of Photoshop for a decade, I thought it was time to get a qualification in digital photography. Having been taught camera mechanics first, most of the later modules encouraged you to experiment to find your own style within different disciplines (portrait, landscape, abstract, urban, macro etc). It was the final two modules detailing how to use Photoshop (Creative Suite) that unnerved me. It was a different tone to the open freedom to experiment. Effectively, they told you what you ‘should’ be doing with images. I’d like to say this was playing around with landscapes to make them look alien with colour change and distortion, or to add many layers of vintage textures and clockwork stock photography for a steampunk creation, but sadly, the course opted to use three prom pictures of teenagers – one male and two female, all white. On one female, they taught you to change the eye colour from blue to green with various techniques. On the same female, flyaway hair was removed. I can’t say either of these things ever happened on my school photos. Next came facial modification. On the male, they took a patch of skin from one part of the face and applied it to another to hide acne. This technique took a long time but he got to keep his skin pores and natural variation in skin tone. Then, on a blonde female, they lassoed her entire face – apart from the eyeballs and lips – and blurred it. In a quick process, the bags under the eyes disappeared along with her skin pores. Her face became homogenised and characterless. Her eyeballs and teeth were made whiter. Her lips were made a shade darker. Then, a software plug-in was demonstrated that identified the skin portions for you – all you had to do was decide the degree of blur and what shade of white. This process took seconds. The second female demonstrated how easy it was to use the nudge tool ‘unnoticed’ when the background was parallel rail tracks. The nudge was used on her entire body to make the female thinner. The strength of the nudge was toned down so “they wouldn’t notice”. Photoshop is rebranded as Creative Suite as it’s no longer about fixing inadequacies with the camera and the exposure. Now we create things that are unreal. I’m disappointed that this photography course opted to demonstrate the creative potential by ‘fixing inadequacies with people’. Software plug-ins make this process extremely quick – an industry of software geared to make people feel bad about themselves by creating an artificial construct. This isn’t just the saturation of the media of this synthetic world – it is pervading school photos now. People can’t trust images in the media and now they can’t trust images of themselves. I had a family portrait recently and I discussed at length the things I didn’t want doing. They seemed surprised but pleased as it meant less work for them editing images! The bags under the eyes are there, the skin pores, the spots, the off-white teeth, the wayward hair. Friends come to me now after they have had professional photographs taken to ask if it’s what they look like. The digital age means we tend to get multiple images from one session, so it’s easy to put them side by side to compare what’s changed. Mostly, the reaction to my detective skills is disappointment – they thought they looked like the photos. That’s when I tell them they look much better than the photos. At that point they often smile and that’s their true beauty. 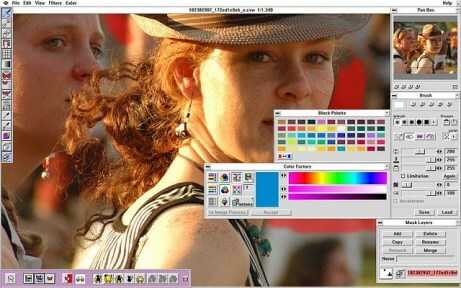 Image is of a photo of two white women being edited in Photoshop, the colour palette in Photoshop can be seen on the right side. It was uploaded by Flickr user Cristian Eslava and has been shared under the Creative Commons Licence. It’s horrifying that a course should operate in this way. Photoshop (or GIMP to those of us with less cash to flash) is an amazing tool, and honestly the creative element is something I enjoy. But it’s not what makes a good photo. I used to edit photographs a lot, relying on software to enhance lighting, create mood and add general punchiness. And yes, when it came to portraiture I also used the software to cure complexion woes. But growing up and seeing the societal shift to soulless plug-in cloning (as well as experiencing the joy of being around genuine, wonderful people) has encouraged me to throw away the magical lure of GIMP in favour of pure photography. In fact, I recently played around with some photos (layering, mirroring etc) and it felt odd. It would be very easy to teach a photo-editing class and not worry about faces in the slightest. Background blurring is a traditional means of emphasising foreground and mimics the same technique perfectly. Likewise, cloning areas of texture can hide an unsightly sign in an otherwise beautiful bush rather than covering up inflamed lumps. And bringing out the highlights in a seascape is much less creepy than making people look like they’re on the verge of internal combustion. And if that weren’t good enough and the photos had to be ones with people in, surely it would make more sense to teach students the single most important thing photo editing allows us to do – airbrushing out the absolute idiot from the background of the otherwise lovely group portrait, gifting everyone with a modified memory of a time made lovelier. PS – my wife just pointed out that, a couple of years back when I graduated, portrait enhancement was an optional extra. I wonder how long it’ll be until it’s automatically applied?